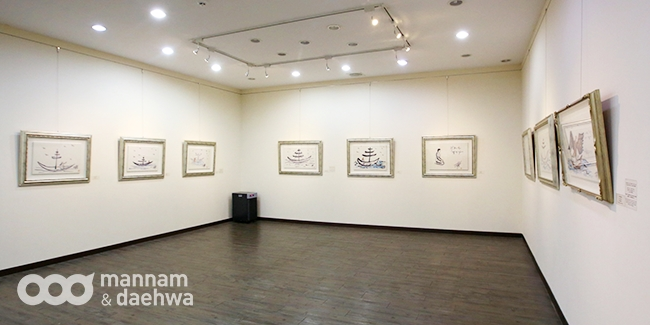 An art exhibition titled, Put up the mast and sails, which displays President Jung Myeong Seok’s artworks, has been opened for viewing at the Gusang Art Museum since March 15, 2015. With the theme of putting up the mast and sail, President Jung painted the eagle as a symbol representing the meaning behind the sail of a boat. These paintings are full of life. The exhibition conveys the message of the difficulty of rowing a boat that does not have sails on it, and the ease of sailing along with the wind. In the same way, when we put up the mast and sail of the Lord on our boat, that is, our life, we will be able to sail through life with ease, having received the power of the Trinity. The last day for this exhibition at the Gusang Art Museum is September 25, 2015. The representative of the museum hopes that, through this exhibition, people will realize the person who saves them and will make Him the sail of their life and triumph in life.